Coverage: Follow the match with the Cricket Social, plus live text commentary on the BBC Sport website and app. England’s preparations for their Test series in the West Indies are “not ideal” but they must “make do”, says veteran seam bowler James Anderson. 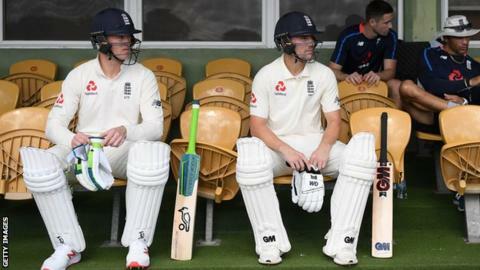 The tourists played two two-day 12-a-side warm-up games before the first Test starts on Wednesday in Barbados. “It’s not ideal, but there’s not much time to get that preparation in so we’ve just to make do with what we’ve got,” added Anderson. Jonny Bairstow made 98, Joe Root 87, Stuart Broad took a hat-trick and Chris Woakes 3-31 during the two fixtures, in which teams could bat on after the 10th wicket fell. Quiz: Can you name last England squad to win in West Indies? The 36-year-old Lancastrian played in the first of the two practice matches, taking four wickets against a Cricket West Indies President’s XI who made the unusual score of 203-19. He told BBC Sport: “The nature of tours nowadays is we’ve only got four days of actual match practice before the first Test so we’ve got to try and get as much out of these days as we can, and I think we’ve done it. “You’ve got to bowl with match intensity; when you’re batting you’ve got to be switched on. “You can have as many nets as you want but you can’t replicate time out in the middle, no matter how forced the games are. England recorded their first series whitewash in Sri Lanka in November but have not won either of their last two tours to the West Indies, with only one series victory in the Caribbean since the 1960s. “We’ve not had much of a break since Sri Lanka so that’s pretty fresh in our minds and everyone has come here in really good shape and ready to go,” Anderson said. England’s record Test wicket-taker is making his third tour of the Caribbean and has 26 wickets in seven matches, 10 of them coming in Barbados. England next visit in March 2022, when Anderson, who also holds the record for most Test wickets by a seam bowler, will be 39. “My focus is on performing well this trip and helping the team win in a Test series. The future will take care of itself so I try and focus on the present,” he said.